I’m still learning the art of processing photos in a digital world. I have basic knowledge, but I feel like there is so much more to learn. I’ve always enjoyed photography, but only in the last year have I actively tried to get better. Part of that process for me is to share with others and actually get people to look at my work. In writing about my photography, I hope to gain a deeper understanding into my thought process as an artist. I also want to gain insight into what constitutes my individual style of photography and what are the aesthetic choices that I make that define that style. One of my favorite photos that I took in 2011 is of my two daughters sitting in the middle of the road. We were on vacation on the East Coast and were just taking a walk to get some air. The girls wandered over to the speed bump and sat right down. I managed to take a few shots before they lost interest. 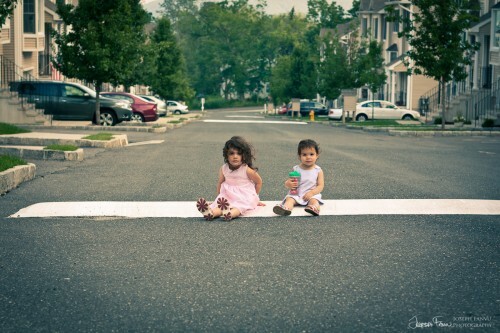 There is something about these 2 girls sitting down right on top of a speed bump that really speaks to me. I like the play of the similarities and the differences between the girls. They’re both in dresses, both sitting, and both staring right at me. However, their dresses and shoes are different, their hair is different and mostly, their expressions are different. 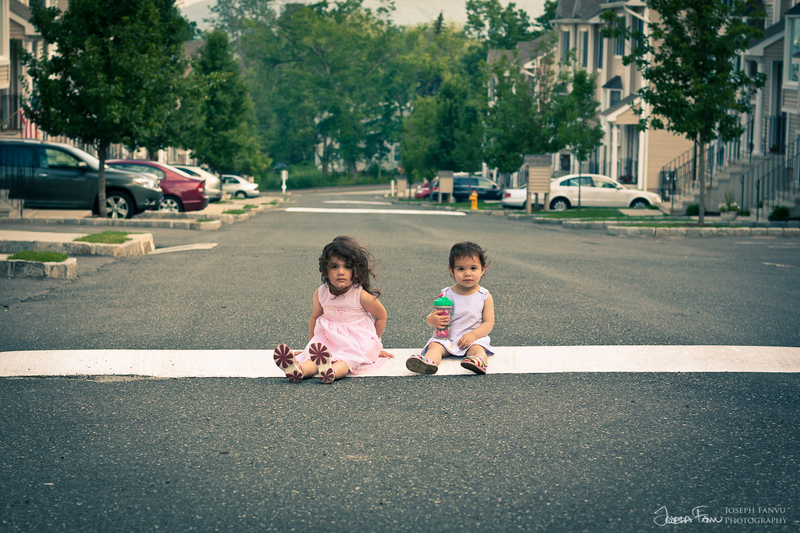 I think the softness of the girls creates a nice contrast to the hard road, the bright speedbump, and the row of cars leading into the background. There are a couple things that I wished were a little bit better about the image, but overall it’s still one of my favorites from our trip. Click each photo to get a bigger view. This is the original image straight out of the camera. I use Lightroom to process most of my photos. 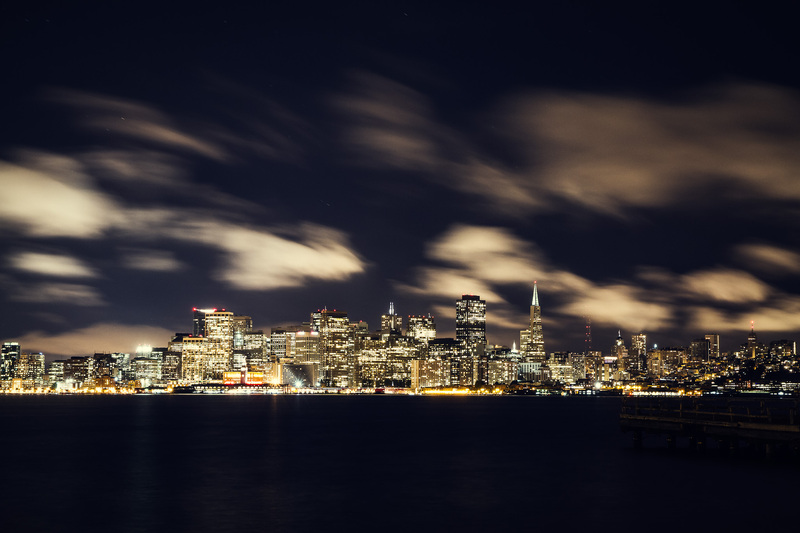 The first thing I did was to increase the clarity, increase the vibrancy, and add a slight vignette to the edges. Already these changes add a nice punch to the image and draw the attention to the subjects. Next, I adjusted the white balance to warm up the picture a bit. I wanted to capture the warmth in the air and so changing the white balance helped. I wanted to give the image a bit of a vintage vibe and cross processed feel so I added some more orange to the highlights and some blue to the shadows. To finish the image, I cropped the photo to center the girls and stretch the speed bump to cover both sides of the frame. Here is the final image.